How Do I Get My iPhone out of Boot Loop? iPhone Stuck in Boot Loop After iOS 12 Update? Fixes Here! iPhone going to reboot loop is a common and known problem for most iPhone models. This problem has been there, but more people have been reporting the problem since the release of iOS 12. When it happens, you observe Apple logo flashing on the screen and instead of booting, the iPhone get restarted again. This behavior repeats several times, and that's why it's called the iPhone boot loop. If you are facing a similar issue, then you don't have to be worried because we have come up with 4 different working and safe solutions to fix iPhone stuck in boot loop issue. Part 1. Why Does Your IPhone Get Stuck in a Reboot Loop? 1. Wrong Update: Apple advice that every iPhone user must update their iPhones to the latest version iOS to enjoy new features, security and to enhance device performance. But sometimes, when you try to update to new iOS versions, you experience unique problems like boot loop. The most common boot loop causes are related to the update process. It could be that you interrupted the update, or you applied the wrong update. 2. Battery Problem: When your iPhone has bad contact with the battery, it could be a viable cause for boot loop. This can happen without you knowing, maybe you dropped your phone or you sat on it, or maybe just mishandled it unknowingly. It could even be that your phone battery is damaged. 3. Jailbreaking iPhone: Your iPhone could breakdown if you try to jailbreak and fail to complete the process accordingly. Sometimes it could be that you successfully completed the jailbreak process but the iPhone caught a malware in the process, making it boot loop. We have done our research and come up with the following four ways to fix the boot loop problem on your iPhone. Force start is probably the easiest and simple approaches for breaking your iPhone reboot loop. All you need to do is to force your device to start to break the recurrent power cycle. If your device is iPhone 6 or former, you can long-press the Power Home and Home button on your iPhone simultaneously for about 13 seconds. You will feel your iPhone vibrating, then it will automatically break the boot loop process. For iPhone 7 and 7 Plus, press the Sleep/Wake and Volume Down buttons simultaneously and your device will restart automatically. 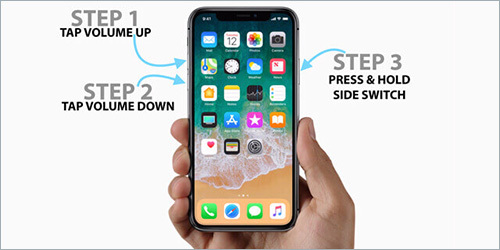 For iPhone 8, iPhone X or later, you need to press the Volume Up button and release it immediately, then press the Volume Download button and release it quickly; next press the Power button until you see the Apple logo. Step 4: Allow iTunes to complete the process. Every restore situation takes time depending on the internet and other factors. Step 5. Check if your iPhone is out of boot loop. If the above methods fail to solve your iPhone problem, then you need a professional iOS repair tool. 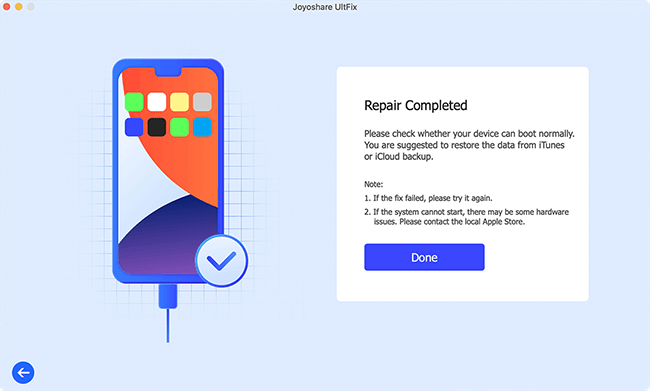 There are several iOS repair tools on the internet that will help fix your iPhone boot loop problem, but Joyoshare UltFix provides you with options to solve more problems with ease. 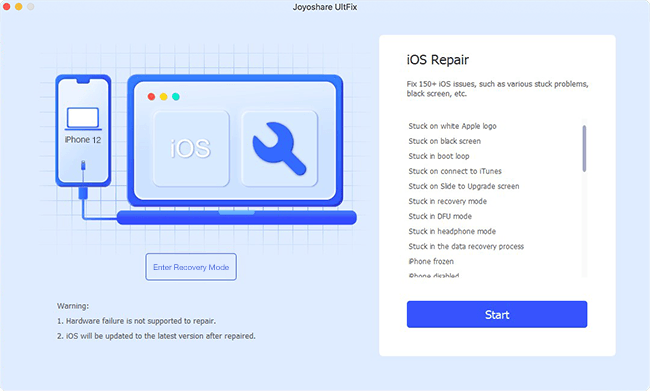 With Joyoshare you can fix iPhone stuck in recovery mode, fix boot loop problem, fix iPhone stuck on Apple logo, and black screen amongst many others with no data loss. 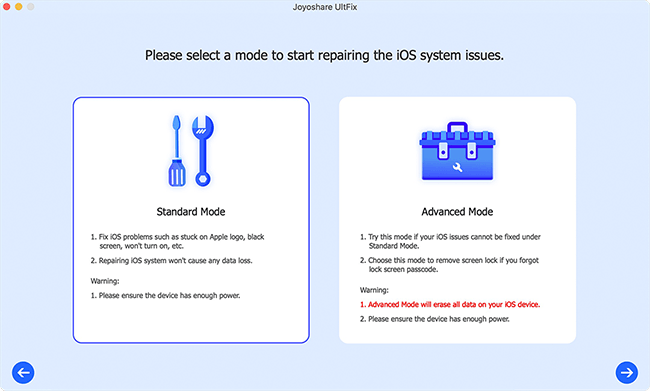 With just a few clicks, you can solve most of your iPhone problem using Joyoshare UltFix iOS system Recovery. Through Joyoshare UltFix, you can solve more than 30 iOS problems not just on your iPhone but also on your iPod and iPad. Joyoshare also allows you to enter in recovery mode in just a single click for free. It also allows you to easily bypass iTunes restore, downgrade iOS versions and others. Step 1: Download Joyoshare UltFix and install it on your computer and then open it. Step 2: Connect your iPhone to the computer using the lightning cable. Joyoshare will automatically detect your device. Click the Start button to get started. Step 3: To avoid data loss, chose Standard Mode. Click the Download button to begin downloading and verifying the firmware. Try Advanced Mode if Standard Mode does not work for you. Step 4: Click Repair button once the download is complete. Wait for the process to autocomplete. Your iPhone is back to normal once more. You can start by using simple methods like hard reset above and move to more secure and advanced methods like using Joyoshare UltFix to bring your iPhone back to normal without data loss. Hope these methods helped fix iPhone reboot loop problem. If not of these work, then you may want to take your iPhone to Apple Store for technical assistance. Fix iPhone "Attempting data recovery"